Let Aaron Process Equipment Company rebuild your existing double arm mixing equipment. Rebuilding your current mixers can save you money and increase your return on investment. Old, worn out machinery can inflate your operating cost thru additional maintenance and repair…not to mention utility costs. Aaron Process Equipment Company takes pride in manufacturing NEW, quality mixing equipment for many different industries and applies these standards when rebuilding existing equipment from your plant. We offer different degrees of repair: from replacing worn out bearings, seals & shafts to complete equipment reconditioning. 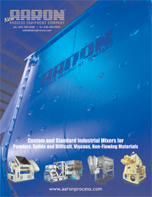 With more than 50 years of experience, the experts at Aaron Process can help assist with the evaluation of your mixing needs, rebuilding or remanufacturing of an existing mixer, trade-in for a new mixer or your next purchase of a new or newly remanufactured double arm mixer, ribbon blender or plow mixer.